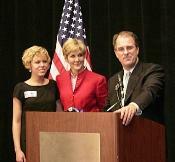 Phill Kline, his wife, Deborah, and daughter Hillary. Phill Kline will have to leave the Johnson County District Attorney's office. Steve Howe, who billed himself as the "unity candidate" won Tuesday's Republican primary 60 percent to Kline's 40 percent. Abortion, and Kline's efforts to fight it, were central issues in the campaign. And, though both Kline and Howe call themselves pro-life, Howe's convincing victory isn't likely to end the split in the Kansas Republican party...not by a long shot.